SPRINGVILLE, Ont. – Katherine Ledlie recalls how she was walking down a hallway at Springdale Country Manor recently when a resident who does not verbally communicate spotted her, smiled and started to do a little dance. This, says Katherine, who is studying nursing at Trent University, is an example of what makes doing a placement in a long-term care home special. 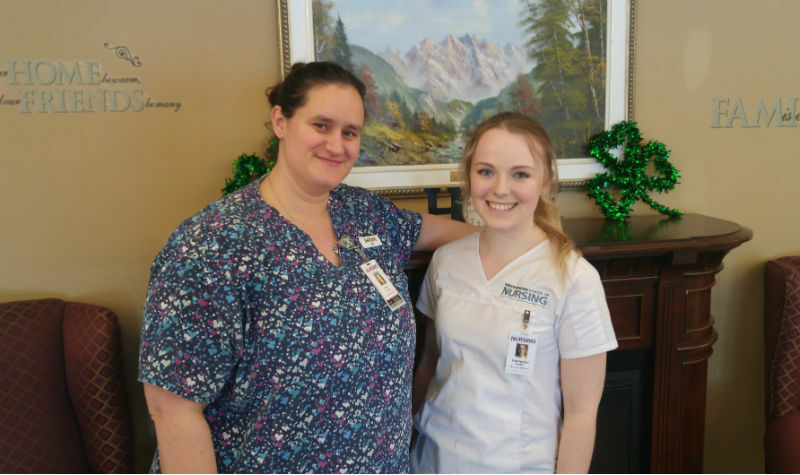 Sarah Towns, a clinical instructor overseeing the students’ placements, says providing nursing students with hands-on experience in a long-term care home is valuable because long-term care settings are quite different from acute-care environments. A major difference, she notes, is health-care professionals often form stronger bonds with the people they care for in a long-term care home. Katherine says her experience with the “dancing resident” made an impression on her and reinforced her decision to pursue a nursing career. “That’s one of the reasons I want to go into a nursing career: it can be challenging but also very, very rewarding,” she says. Currently, two groups of eight Trent nursing students are coming to Springdale twice per day, from 7 a.m. to 1 p.m. and from 1 p.m. to 7 p.m., on Mondays and Tuesdays. The students are in the second semester of their first year, and this is their first clinical placement. Students are mainly learning about the work personal support workers (PSWs) do.